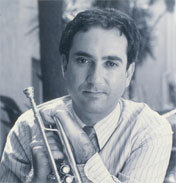 Jim Centorino is a prolific composer and accomplished trumpet player. A native of Salem, Massachusetts, Jim became involved with music before he could read. His formal studies in music began with local piano, accordion and trumpet teachers and escalated to drum and bugle corps and various band activities through high school and college. While at Boston College, Jim starred as featured trumpet soloist and was band president, where his focus was on concert programs of popular music. He was also the featured soloist for the Boston Crusaders and the Rhode Island Matadors drum and bugle corps and was inducted into the Massachusetts Drum Corps Hall of Fame and the World Drum Corps Hall of Fame. As soloist and group performer, Jim has played to packed stadiums and on radio and television. He has played the National Anthem at games for Boston College sporting events, as well as for the Boston Celtics, Boston Bruins, New England Patriots, Los Angeles Kings and Los Angeles Lakers. He was inducted into the Buglers' Hall Of Fame in 2005. Educationally, Jim has earned bachelors and masters degrees in Geology and Geophysics from Boston College, where he was named as a member of the scientific research society, Sigma Xi. He then studied music composition and trumpet at The Boston Conservatory of Music, under the tutelage of his music mentor, Dr. Hugo F. Norden, where he graduated as valedictorian, earning bachelors and masters degrees in trumpet and composition, where he was named to the musical fraternity, Pi Kappa Lambda. Residing in Southern California, Jim considers science, music and mathematics interrelated. Among Centorino's hundreds of compositions, many are published and have been performed live, and are regularly broadcast internationally. Jim's music is influenced by the people, places and events in his life. His debut release, FOOTSTEPS IN THE SAND, a collaboration with composer/pianist Carole Cole, was a top selling album for World Disc and continues to attract new audiences. Ultimately Love is a most requested and broadcasted piece of music. His solo debut, IVORY, is a compilation of original compositions musically descriptive of endangered and threatened wildlife and portrays their beauty, ferocity and splendor. IT'S CHRISTMAS EVERYWHERE, which is a contemporary blend of traditional and original material, resonates with festivity and evocative melodies. PORTRAITS OF AMERICA is a visual, musical journey through America. THREE DREAMS is "A romantic odyssey for the soul." MINI SAMPLER #1 features Home of the Humpback, Notes on a Triangle as performed by Bb Clarinetist Jim Kanter and pianist Carol Cole, and Ivory (original recording with rifle shots). BANANAS FOR LUNCH! is an album of happy and upbeat instrumental music for children. Jim's classical composition TRE CANZONI PICCOLI was recorded in 2013 by BSO 'cellist Joel Moerschel and Boston Conservatory Faculty pianist Lisa Caliri, who also recorded Jim's classical compositions titled, EIGHT PIECES FOR SOLO 'CELLO, A SHORT STORY and NOTES ON A TRIANGLE in 2015. These recordings will be released on a separate album, a collection of classical compositions by Jim Centorino. SENIOR PROM, The Musical, Vocal Album was released in August of 2018. It features 17 original vocals, as sung by the original student cast of the musical. It is available from CD Baby and iTunes.